Camilla Labate is a young girl from Vicenza, Italy. She has a Bachelor degree in Translation and Interpreting and a Masters degree in International Development Cooperation, both from the University of Trieste. In the past year she attended two courses at the University of Padua, both of the duration of 9 months: one in "Project management and EU financed programmes" and the other one in "Latin American studies". 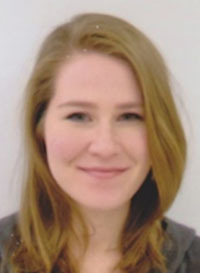 In 2010 she did a four-month internship at the World Health Organization (WHO) in Geneva, Switzerland and worked on a research regarding social support measures in favour of people suffering from HIV/AIDS and tuberculosis contained in grants awarded by the Global Fund to fight AIDS, TB and malaria. She did many experiences abroad during her high school and university years: a ten-month exchange programme in the USA (2004-2005), a four-month exchange in Germany (2008) and a semester in Spain (2010). She is a member of an Italian NGO (IBO Italia) with whom she takes part in volunteer activities, both in Italy and abroad. Indeed, in summer 2012 she went to Bellary, India, for a month and worked in a centre for disabled and blind children. In the past six months she has been working for COOPI (Cooperazione Internazionale), an Italian humanitarian NGO. She was part of a team in charge of organizing fund raising activities. At the moment, she is doing an international internship with Human IS Right in Buea, Cameroon. She is working at the Prisoners' Rights Project together with other interns and will stay for 4 months. 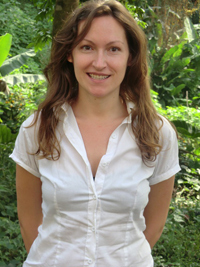 Iolanda Apostoaiei has a strong passion for the International Cooperation field and for the defence of Human Rights. She holds a degree in Social Sciences for Cooperation and Development from La Sapienza University in Rome and is currently preparing the thesis for the Master in Migration and Transnationalism that she is following at Universidade Nova in Lisbon. She has a long term voluntary experience in Italy and Portugal, having worked with less advantaged communities, for NGOs( Caritas, Sant'Egiodio, Conselho Portugues para os Refugiados)that deal with immigrants, asylum seekers and refugees, with a special attention to women and children in diffucult situations. At the moment she is an intern at Human is Right, working for the Prisioner's Right Project. Her tasks here include collecting field data, giving legal support and facilitate the re-integration of the detenees in the Buea Prison. Linda Zaccour is young girl from Italy, she studied Anthropology at University of Bologna. She took the first degree in cultural anthropology in 2012. She is really interested to observe the human behavior and how it works. As a long time experience as a volunteer working with emigrants, especially supporting their integration in the society by teaching Italian language. At moment she is doing her first experience inside abroad in collaboration with the NGO Human is Right. 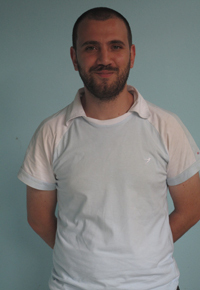 Uriel Mazzoli is a young man from Italy interested in Internationational Cooperationship Project. He got a degree in Political Science in 2005 at the University of Milano. Since that time he continued to train himself in experience abroad. During the year 2010 he spent one year working as youth educator in Poland through the European Voluntary Service program. After this experience he was able to take an internship in an italian NGO which take care of Childhood's Rights protection. 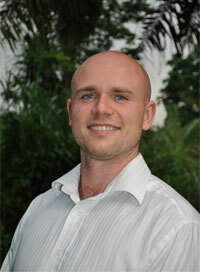 He has a strong passion for International Cooperation projects and International Journalism. 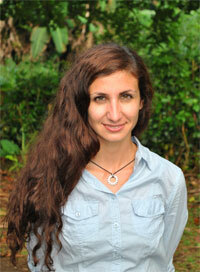 Ksenia Arefeva is performing in a field of social work and international cooperation since 2008. She is a constant member of NGO "Children's Project" in Russia which is helping to provide trainings for adaptation and socialization in society of children-orphans and children from families in trouble. In 2011 she was taking part in European Voluntary Services program and working one year in Poland as coor inator of international voluntary projects. She has strong passion for protection of Children's Rights. 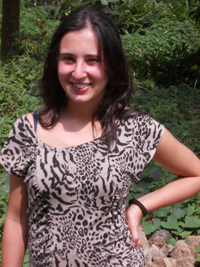 Graziella is a young professional strongly committed to promoting and protecting human rights. She earned a Master's Degree in International Relations and a Bachelor's Degree in International and Diplomatic Sciences. She has five years practical experience in international development and humanitarian aid in the Dominican Republic and Haiti. 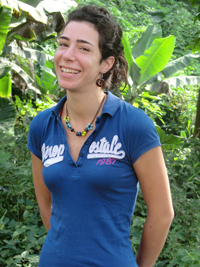 She joined the Dominican branch of the Jesuit Refugee Service working as a Research Office Coordinator. 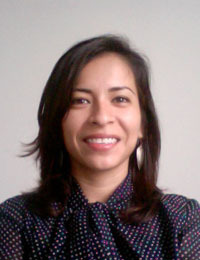 She conducted studies on human rights violations and socio-economic analysis regarding Haitian migrants in the DR. She is also a member of the Editorial Team of Estudios Sociales Journal, a Dominican journal that addresses the issues of human rights, democracy, gender, migration and social policies. Graziella is interested on racism, migration and gender equality. Mark is from Ireland and is a passionate advocate of human rights. Mark is a Master Honours Law Graduate, with a LL.M from Trinity College Dublin and a Bachelor's Degree in Business & Law from University College Dublin. Mark is also a qualified Attorney-at-Law in New York. 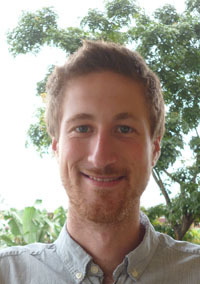 Throughout his university education, Mark maintained an avid interest in Human Rights Law and wrote the thesis for his Masters on International Human Rights Law and was awarded first class honours for this paper. Mark has three and half years' experience working in the Irish legal industry where he developed strong problem solving capability and excellent communication skills, which together with a natural capacity to work hard, makes him an effective operative in human rights promotion and protection. 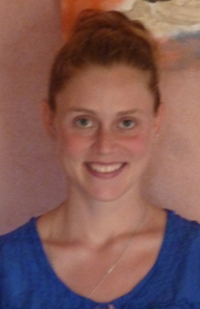 Megan Herweyer comes from Canada and will be interning with us until August 2014. She is passionate about human rights, refugees and immigration, and She studied Political Science and Sociology at the University of Guelph in which she specialized in developmental and international politics. 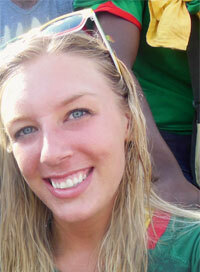 She has many experiences abroad including doing a semester abroad in Sweden and traveling much of Europe. She is currently working on the new human rights and gender project which is a new initiative for Human Is Right focusing on women's rights in rural villages around Buea. When she returns to Canada she will be furthering her education by doing a post-graduate program in International Development Project Management. Roc¡o Flores Fuertes is a Spanish young lawyer with almost 4 years experience. She is particularly interested in deepening about the challenges that the implementation of human rights faces in developing countries from a legal perspective. She has a law degree in the Universidad Complutense de Madrid and she also spent a year of her undergraduate education at Universit‚ Robert Schuman in Strasbourg. After graduating, she did a Master's degree in International Affairs, consisting of a study of the international landscape from an economic, legal, and political perspective. Later, she worked for almost three years in a competitive law firm in Madrid. While working in this firm, she simultaneously obtained a Postgraduate Degree in Peaceful Conflict Resolution and Peacekeeping at the Instituto Universitario General Guti‚rrez Mellado in Madrid. The programme was focused on international humanitarian law and the study of the legal tools to promote the conciliation in a context of conflicts. After that, she also did a Master's Degree in Intellectual Property Law at King's College London. Finally, during the last months she worked as a lawyer for a company in Spain that manages professional musicians. In addition to her formation as a professional, as an undergraduate at the University, she founded a group dedicated to increasing awareness of womenïs issues, particularly in the workforce, and generating debate about modifying the system to promote equality. Also, for the past year she has been a volunteer at an NGO that is dedicated to integrating the indigent into society. Briana, an international intern from the United States, is a young professional committed to protecting and promoting international human rights. She earned a Bachelor's Degree in French with concentrations in Management Studies and Film Studies from St. Olaf College in 2012. As an undergraduate, she took an avid interest in international studies and human rights, participating in Model United Nations, ESL (English as a Second Language) tutoring, and a study abroad experience in Rennes, France. Following graduation, she worked in the legal field at The Advocates for Human Rights located in Minneapolis, Minnesota - an international human rights organization dedicated to providing pro bono legal services to individuals seeking asylum. As a result of her experience working with Cameroonian asylum seekers, she sought out a field experience in order to continue her work with this inspiring population. At Human IS Right, she will be lending her experience and passion to the success of the Prisoner's Rights Project, as well as the Gender Rights Project. Following her time in Cameroon, she plans to continue her studies in international sustainable development and policy with a focus on gender rights. Djouna Vodoz comes from Switzerland, where she completed her studies in September 2013 : a Master of international law at the University of Neuchƒtel (CH) following a Bachelor in international relations at the University of Geneva (CH). She worked as an assistant in the Migration Center of the University for one year in the meantime, reviewing and editing academic articles about international and swiss migration laws. With a strong passion for travelling and getting in touch with different cultures, she visited several countries in Africa and elsewhere. 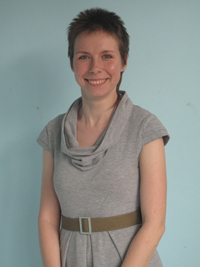 As a volunteer, she taught French in a school in Togo and participated in HIV workshops there and in Uganda. Convinced of the benefits of associative work, she also taught English to prisoners on a weekly basis while in Switzerland, as a member of GESEPI (Groupement ‚tudiant suisse d'enseignement aux personnes incarc‚r‚es). Taking advantage of her availability at the end of her studies, she did a one-year travel around the world, finishing it in Buea in August 2014 for a seven weeks internship in the prisoners' right project of Human Is Right. Being really concerned about human rights, she hopes this experience will lead to others in the same field. Jonathan Th‚voz has recently finished his master in international law at the Universit‚ de Neuchƒtel, spending a year in the Universidad Complutense de Madrid. During his studies, he constantly chose to focus on humanitarian and human rights law and more specifically on the issue of persons deprived of their liberty, whether for criminal procedures or in the context of an armed conflict. When he was a student, he had the opportunity to work in the penitentiary field, teaching languages to pre-trial detainees to maintain their link with the outside world. An internship at Human Is Right in Buea represents moreover a good way for him to reconcile his interest for the prisoners' rights and the several cooperation projects he has collaborated with for a couple of years in the Littoral region of Cameroon. Thanks to the geographic vicinity, he is able to give a serious push in the activities of Direction N'tolo, the association he co-founded more than a decade ago. His experience at Human Is Right is a perfect introduction to get used to work with human rights activists, administrative officials and prisoners in a different cultural environment. Mayra comes from Italy, where she's going to complete a BA in economic development, international cooperation and conflict management. Five years working in an accountancy office as an accounting clerk enabled her to increase her personal management skills, and increased her awareness of the dynamics of bureaucratic businesses. Her extensive travelling experiences in Europe and East Europe, and the fact that she was born in Per— and raised in Italy, has offered her many opportunities to adapt to new environments. She has learned how important it is to be flexible and make use of her own resources, and believe in the trust among people. 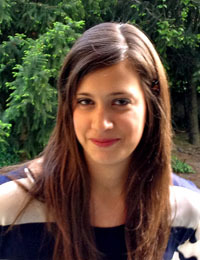 As a volunteer she organized many events to increase public awareness with associations like Greenpeace and Senzatomica. Last summer she worked for an intercultural project in North India helping children with math, arts, English and exchanging culture with them, in a school in Dharamshala. 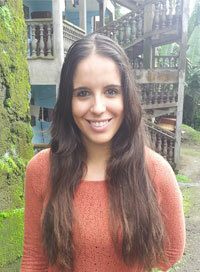 These experiences and her studies re-affirmed her interest in the field of human rights and conflict management. In this moment she's preparing a bachelor thesis about the prevention and protection of human rights and she's sure that the experience with HisR will help her to put into practice what she has learned in her accademic studies. Michela Gaffuri Riva comes from Italy and has a strong interest in working in the field of promotion and protection of human rights. She studied Political Science and International Relations at the University of Padova and Planning and Management of Social Policies and Services at the University of Milan. She has been volunteering for many years for some non-profit organisations working on children rights, social inclusion of migrant population and enhancement of a multicultural society.She is also passionate about communication and journalism and she was an intern in an Italian press agency. Michela wrote a Master's Degree thesis on the subject of extraordinary renditions and the affirmation of an individual and collective right to truth, dealing with many issues related to arbitrary detention and detainees' rights from a legal and a social point of view. She is currently working on the Prisoner's Rights Project and collaborating with the Supporting Gender Equality in Rural Cameroon Project. She will be interning with Human Is Right 'till June 2014. Shona Flaherty comes from Ireland, and is a recent B.A. graduate of Politics and International Relations from University College Dublin, with a particular interest in Humanitarian Action, International Justice, Development, and the role of supra-national institutions in these areas. She has worked to raise awareness of global issues with the Irish NGO 'Suas', and has been involved in many fundraising and advocacy campaigns for recent natural disasters such as Typhoon Haiyan and the 2011 Tohoku Earthquake and Tsunami Appeal while in University. 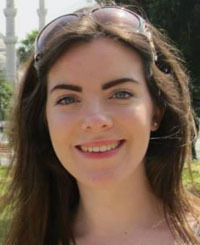 Widely travelled, and with a keen interest in learning about different people and cultures, she hopes her experiences in Cameroon will prove beneficial both to the detainees and to her own personal learning, so she may better assist the cause of Prisoners Rights, and further, Human Rights in general.